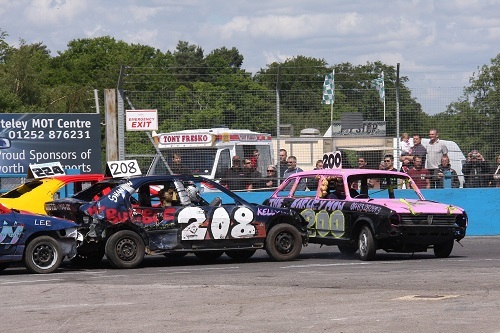 The name Banger conjures up an impression of heavy contact racing, the 'rookie' Bangers however are an exception to this, being a 'limited contact' class. The limited contact Ladies Bangers formula is designed to tempt you, the spectator off the terrace and onto the track for the first time. The cost and preparation are kept to a minimum in the Bangers. The cars used are all generally standard cars, with the radiator being kept within the engine bay preventing any 'heavy' contact, although there is still enough contact to keep the spectator interested! Equally entertaining and interesting is the type of car that is used in this formula, where cars considered useless are resurrected and brought back into service.